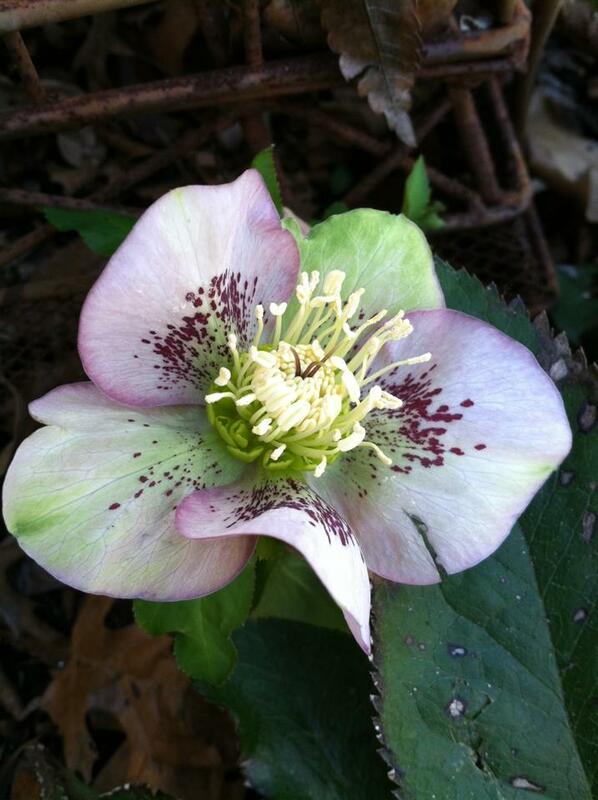 Monday Musings: Spring is on the way! One of the things I so love about living in New England is the fact that we get to experience every season. I love and appreciate them all, even winter. My scrapbooks and photo albums would not be complete if they did not have photos from each season: snow days, snow men, and sledding in the winter, jumping in the leaves, apple and pumpkin picking in the fall, and of course my all-time favorites: swimming, fishing and boating in the summer. When I first met my husband, I distinctly remember though, a conversation where we discussed the start of spring. Not the first official calendar day of spring, but rather the first day. That day you know that spring is coming. The sky is blue, the sun shines, it looks like spring, it even smells like spring. We both knew which day we were talking about and we both knew that there was nothing like that day every year. I know too, that if we didn’t experience the winter, we would not appreciate the spring, not as much as we do. Today, I was reminded of that conversation and I actually think of it every year at the start of spring. After a particularly long, snowy winter, today was gorgeous. The sun was shining and the sky was blue. We’ve been seeing buds from our flowers appearing in recent weeks. The days are now officially longer. It’s coming, and I’m so excited for a new year’s springtime to start. This week, the kids brought out the jump ropes, and played outside again, without needing snow boots and snow pants. 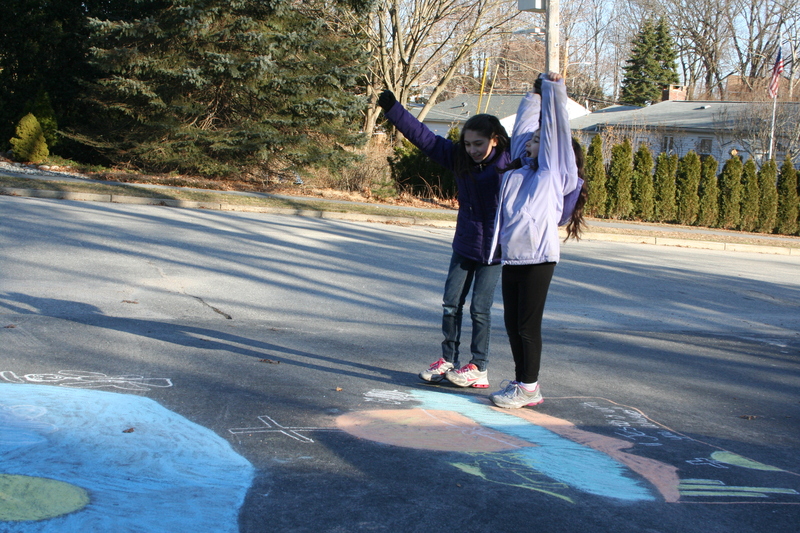 A sure sign that spring is on the way: the sidewalk chalk is out! And today….today they played with the sidewalk chalk in the driveway. I absolutely love sidewalk chalk. 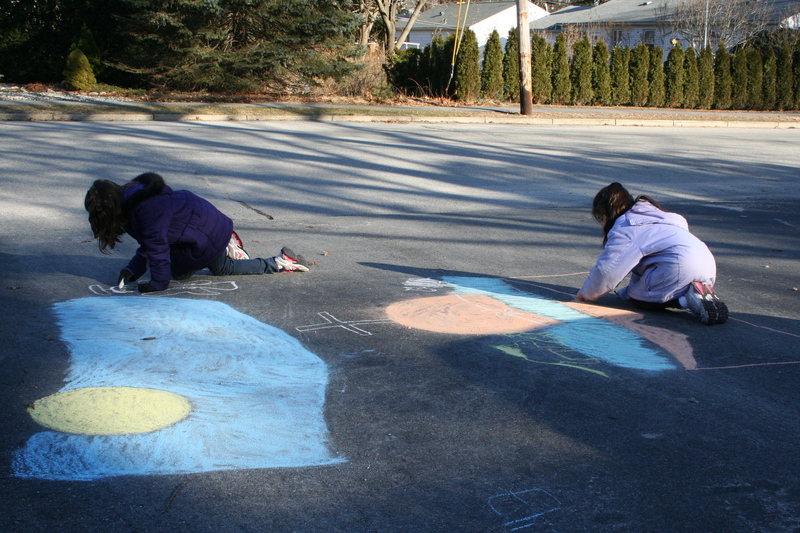 I think that it’s one of the truest signs that spring is coming, when I see our driveway covered in my kids’ artwork. You never know what they’re going to draw and it’s always beautiful, full of bright colors and it’s always creative, full of whatever theme they’re currently into at the moment. It changes after each rainstorm, another sure sign of spring. And then, new art appears. I used to run classes at my house when I was a Stampin’ Up! demonstrator and I once had a customer say to me that she always waited with great anticipation to see what the art would be on our driveway whenever she came to our house. It always made her smile. It always makes me smile too. I love seeing it in front of me when I back out of the driveway and I love seeing it again when I come home at the end of the day. It’s warm and it’s welcoming. Last summer, after several seasons of wishing and hoping for one, I received a special gift for my birthday from my husband: a bench for my front yard so that I could sit out there and watch my kids play in the spring, summer and fall; I could curl up and read a book, and all the while, listen to them chattering, running, jumping, riding bikes and scooters, and watch them with their chalk. Big bows and applause for a job well done! Today, I pulled my bench out of the garage and dragged it out to the driveway. I got my book, my camera and my phone, and a blanket for my legs. And then out I went to watch my kids, as they ushered in the spring. I try to convince myself that if I could have this dessert more than once a year, it would not be as special. I’m not quite convinced yet. Originally Posted September 14, 2012. Reposting this recipe today, September 9, 2013, in honor of my mom’s birthday! You know how little kids say they wish it were Christmas every day, or their birthday every day? Isn’t our answer that if it were every day, then it wouldn’t be special when we had it, that it has to be once a year or it wouldn’t mean as much? I wish I could have Plum Crunch every day. Well, if not every day, then at least more than the once-a-year that I do have it. Why, you ask, do we only have this once a year? I’m sure you were asking. Somewhere, someone is asking right now. It’s because it uses a particular kind of plum, not just any plum, an Italian Prune Plum, these little half-sized plums that are available in our stores just in the fall. Really, just in September. As a kid, I remember having them for my school lunch snacks in the fall. They’re just so cute. Cuter than the plums you get all the rest of the time. And they make this recipe SO delicious. My mom made it every fall and she and I love it more than anyone in our family, hands down. I actually had a little thrill when I gave my kids these plums for the first time, as it brought back memories of eating them myself as a kid. I love passing those types of memories and traditions down to my own kids as well. 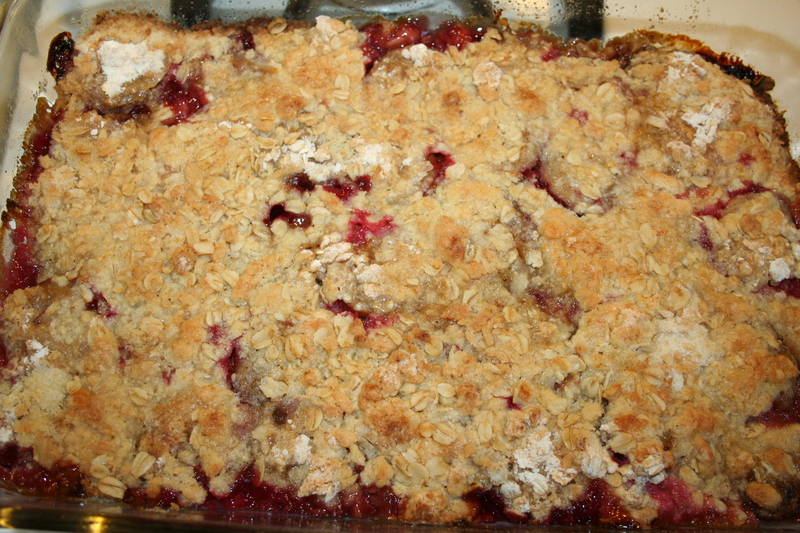 Now I will say, I’ve never tried this Plum Crunch with any other kind of plum, but I just assume it won’t be the same because otherwise the recipe would say you could use any plums and eat it any time. So before the window has shut for you to try this recipe I am sharing it with you today. Quick, run out and get your plums so you can try it this weekend! This recipe is so simple, we always have everything in the house to make it, except for the plums. Spray 9×13 baking dish with no stick spray. 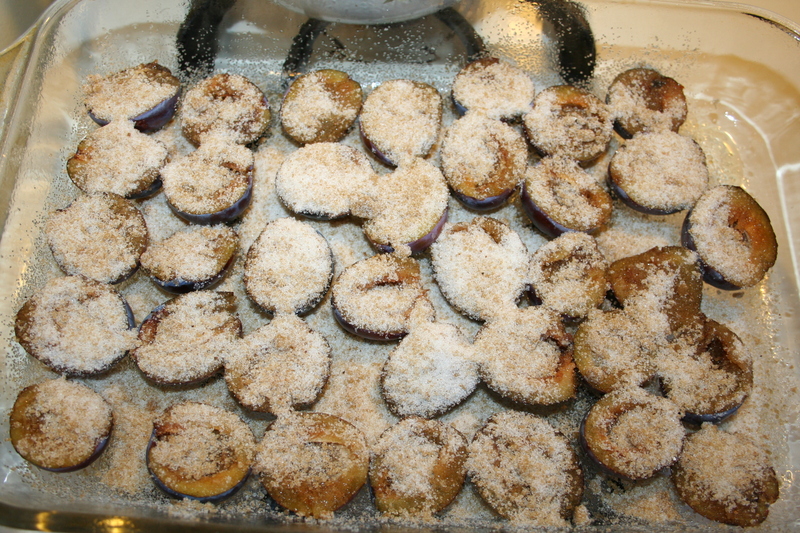 Put prepared plums cut side up on the bottom of the pan. Mix the two sugars and the nutmeg together and sprinkle over fruit. 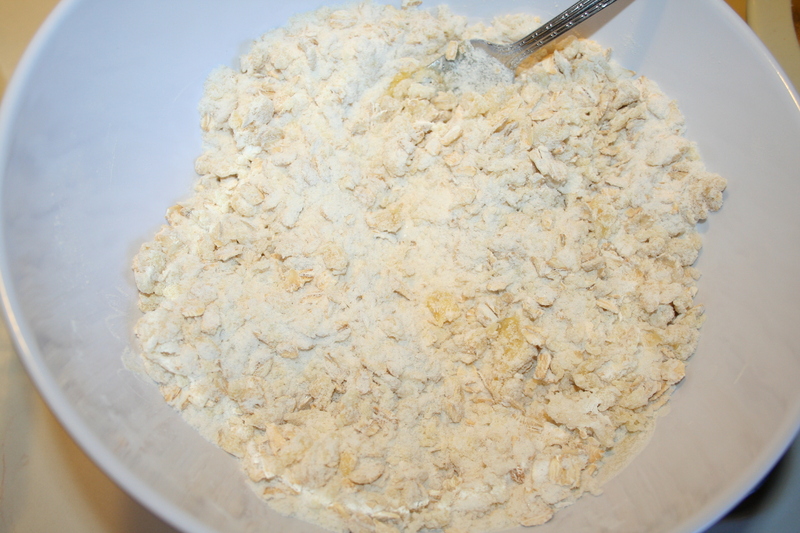 Beat the egg in a bowl, then add the dry ingredients together. Mix til crumbly. Sprinkle over plums. Bake in 375 degree oven for 35 minutes.